If you have “Enchantment” you will want to add this to your collection. “The Water is Wide” is perhaps my favorite song. I felt that her voice was intoxicating. 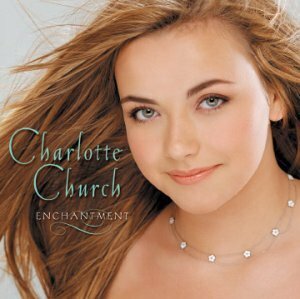 While Enchantment is still my favorite, this really celebrates Charlotte’s voice and beauty of spirit. 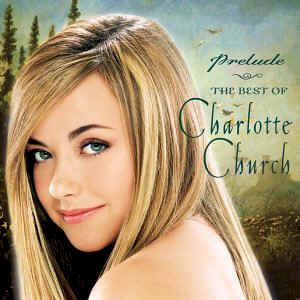 Prelude: The best of Charlotte Church is a celebration of Charlotte’s best selling albums. There are four unreleased tracks. These are some of her most eloquent performances to date. Her voice is captivating and she is the youngest artist to ever have a #1 album on the UK Classical charts. 1. "Pie Jesu" (from Requiem by Andrew Lloyd Webber) is perhaps one of the most beautiful songs ever written. Charlotte adds her angelic voice to this spiritually uplifting and memorable song about everlasting peace and forgiveness. She hits high notes that send shivers through your being. It is terribly beautiful. The first time I heard Charlotte sing this song I played it over and over again. 3. "In Trutina" (from Carmina Burana by Carl Orff) is a song about being suspended between love and chastity. It is bittersweet and embodies sacrifice and longing. 4. César Franck's "Panis Angelicus" is a deeply spiritual song about heavenly bread. 5. "Amazing Grace" from Charlotte's debut album Voice Of An Angel is deeply moving and again Charlotte’s innocent voice is perfect for this song. 6. "Just Wave Hello" has an ethereal quality and instead of waving goodbye, she is waving hello to the future, to follow the sun. This is about a new day, about the sun rising or about dreams that inspire. This song really takes off. 7. "La Pastorella" (from Soirées Musicales by Gioacchino Rossini) is a song about a beautiful shepherdess who offers a basket of fresh fruit and flowers. She is mysterious as her inner thoughts will only be given to one. 8. The traditional Irish ballad "She Moved Through The Fair" is soothing and romantic. 9. "Ave Maria" (adapted to the 1st Prelude of Johann Sebastian Bach) instantly transports you to a place no other song can take you. It is a place of complete security and joy. And yet there is a note of sadness in the birth of joy. 10. "Dream A Dream - (Elysium)" (Charlotte's duet with Billy Gilman) was originally found on Dream A Dream. 12. “Habañera" (composed by Georges Bizet) speaks of Love as being a rebellious bird. There is nothing that can tame love. Subtle energy embraces you with sensuality and smooth seductive tones. 13. "The Prayer" (duet with Josh Groban, composed by David Foster and Carole Bayer Sager) is another classic. It speaks of a dream for a world where there is no more violence and suffering. 14. "All Love Can Be" was originally found on the movie soundtrack, A Beautiful Mind. It is about perhaps what true love can do. Maybe it is the type of love we all look for. 15. "It's The Heart That Matters Most" speaks of magic in the air and about giving love because that is what matters most. 16. Gabriel Faure's "Tantum Ergo" worships the creator. 17. Paul Simon's "Bridge Over Troubled Water" takes on an entire new perspective. 18. Pietro Mascagni's "Sancta Maria" is a song about Mary, blessed amongst women. Due to the spiritual nature of many of the selections, I can highly recommend this CD in particular for the Holiday Season. Charlotte’s voice has never sounded so lovely! Refreshingly innocent and inspirational. Beautiful music mingling with an equally exquisite voice. If you ever doubted this girl is an angel, this album will dissuade all doubt. Charlotte Church's voice dances into this compilation of songs with exuberance as she sings of anticipation. Her voice mingles with a huge orchestral accompaniment. She then floats on to Carrickfergus where she wishes she could swim over the deep ocean to a castle to find her love. She laments she has no wings to fly. In my opinion, the Carrickfergus song is the best on the CD as the words are so poetic and filled with longing. It is a Celtic masterpiece! Suddenly you are transported to Spain in Habanera, as a subtle energy embraces you with sensuality and smooth seductive tones. To my absolute delight guitarist Jesse Cook makes his appearance. Bali Ha'i sends shivers over your body as if a fairy had sprinkled magic dust into the air. It is an exotic song of love, and how we are all really living on a lonely island in the middle of a foggy sea, longing for another island where we would like to be. You feel almost lulled into a haunting trance as she sings: "If you try you will find me where the sky meets the sea." Pure Magic. Papa Can You Hear Me seems to roll like a life moving forward seeking to return to childhood, but knowing it can never be again. Surely God steals away from heaven to hear Charlotte sing this song. The Flower Duet is an echo of ecstasy which can memorize you into a thoughtless existence, then it flows nicely into The Little Horses, a vibrant lullaby. From My First Moment is spectacular in every way and embodies the concept of cherishment. The souls longing to dance on earth with other souls or to be sweetly and indulgently loved. It embodies the purest essence of the human soul. The Water is Wide is a song in which words from the heart reach across the miles when you cannot be with your true love. Words become the wings of the soul and two souls dance above the turbulent sea, somehow meeting in the air. It is filled with longing as most of the songs are. The next two songs are lighter and fun as the music almost seems to burst into laughter. If I Loved You is a classic and speaks of a girl who wonders about how it would be to be in love. What would she say, what would she want her love to know? It is intensely beautiful and she imagines herself going in circles, longing to tell how she feels yet shy. She fears she would let her golden chances pass her by. A Bit of Earth seems to speak of hope. Seeds planted growing to beautiful flowers. It is a comforting song with a sad note because even flowers die. Somewhere follows and tells of a time for everything. The Prayer is one of the most beautiful songs ever written. There is a sense throughout the entire CD of a longing for a more beautiful life filled with love. This is perhaps the most beautiful CD I now own. My only complaint was that the lyrics were not included. However it was fun to read what Charlotte was feeling at the time of the recording. Charlotte Church's voice is Intoxicating! Charlotte's voice is even more spectacular when she is singing in concert. And who could not love a singer who introduces her Teddy Bear to the audience? It was so cute and made you realize how young she actually was when she sang at her first solo concert. Here she takes center stage for the first time, makes jokes that the audience loves and declares that various songs are of unknown origin. She is quite the personality and I had to just laugh when she declared that the Men of Harlech were looking so "posh" in their matching suits. By watching her in concert you will be able to see the contrast between her teenage personality and her angelic and almost adult presence when singing for an audience. It is as if an angelic force pervades her very being. She could be as ancient an angel as one who first sang for God at the beginning of time. Within her is a beautiful soul which radiates throughout her being when she is on a stage. I noticed how while practicing her songs she seems much more shy, but she comes alive completely onstage. There are times when she does seem under the spell of her own voice. a grown man to tears. In this DVD, you get to see behind-the-scenes footage and glimpses of her life. Everyone in her life seems to just come alive in a new way when they are around her. It is as if the light in her being also flows to everyone around her. Of course, she was also a very young Welsh schoolgirl at the time who was known to pout and have disagreements with her mom. She is very human and yet has been blessed with an amazing talent. We forget all about how human she is when hearing her sing her signature tune, Pie Jesu. Especially while surrounded by candles and an amazing orchestral accompaniment. The sheer confidence everyone places in Charlotte was part of what impressed me. Part of the beauty of her voice is the innocence. She is truly a natural. In a way, it is unfair to compare her to anyone else. She is unique. This is a child who took charge of her own future at a very early age. In this DVD you will see how she actually started her career by her own actions. It is not her mother pushing her, but rather encouraging her to be the best she can be. They show Charlotte and her mother laughing and it does seem they have a very good relationship. I look forward to seeing her acting in the 2003 release of "I'll be There," which is a comedy. She actually made her acting debut in the UK TV drama 'Heartbeat'. Charlotte's biggest ambition is to sing in her favorite opera - Madame Butterfly -at La Scala in Milan. You know, this Welsh soprano might just do it one day. After all, she has already had a concert at The Megaron in Athens. At 17, she has seen so much success. I can only imagine a wonderful future for this motivated young star. She was born Feb. 21, 1986. Sometimes in this world where we live with tragedy and sorrow day after day, God does something miraculous. He gives us a Charlotte Church.